I was born in Michigan with a paint brush in my hand and the two of us have never since been separated. 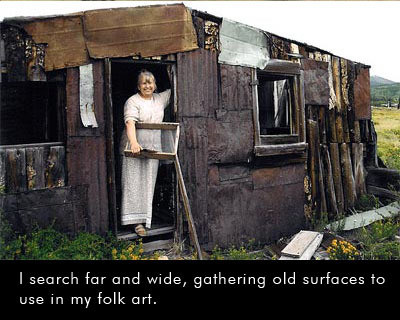 My life's journey to folk art has been full of adventure. In my early 20s, I flew for Pan American. That job allowed me to experience varied cultures -specifically art from Africa to Australia, Argentina to Austria and more! During my last three years with Pan Am, I created and ran my own art gallery in Tiburon, just north of San Francisco. After 7 years with Pan Am, I moved to Berlin, Germany. While there I discovered and became particularly fond of the joy and innocence in Bavarian folk art. Seven years in Europe was followed by a move to Santa Fe, NM. Three years of clear light and wide horizons, plus the bonus of meeting painters, potters, weavers and more, resulted in new visions for creative expression. Sea level, Boca Raton, FL was my next stop. Turquoise waters, lime green landscapes, and pink flamingos provide more than enough color to keep any artist excited, but I had two small boys who demanded most of my creative energy then. It thus, wasn't until I moved to Roswell, GA, that the fullness of time had arrived and I was able to answer the call to paint full time. Cows were my starting point, Cows have a special place in my heart and in my family's history. 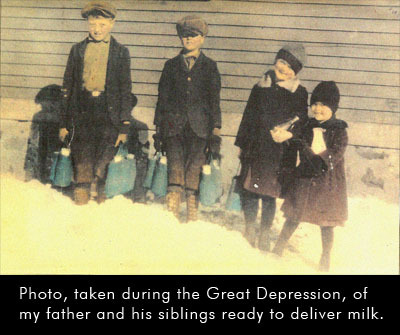 God provided cows and thus my Finnish grandmother and her five children were able to survive the great Depression. I can still remember their warm eyes- who could resist them? However, my artwork soon expanded to include the mysteries in the woods and very womanly pears. Part of my attraction to folk art is that there are few restraints - just a call to follow the muse of the day. Painting on found objects like vintage windows, rusty tin ceiling tiles, chippy painted doors or even an old fuse box or a wood ironing board excite me. Just give me a textured surface I can interact with and I'm in heaven! Many mornings are spent over coffee while studying the mark of the patina of time on my awaiting surface and soon the direction for the day is found. So now as you read this, you are entering my picture. My hope is that in some way your heart has been touched, or amused by my art and the full circle my spirit has traveled to create it. For me, this is the magic moment when art in it's purest level has been reached.